If you've never heard of TED, prepare to lose an afternoon or five to watching some of the most incredible lectures, talks, and tech demos you've ever seen. Examples: Malcom Gladwell at the peak of his game, Ze Frank at the cusp of his internet stardom, Multitouch's coming-out party, and learning why what you think will make you happy is, well, not (if you only hit one of these links, hit that last one). 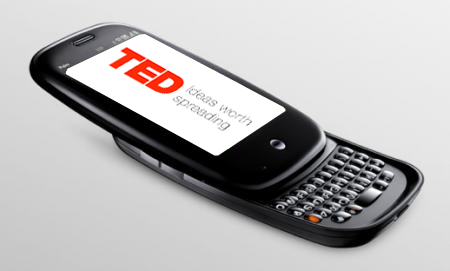 TED is an invite-only conference for innovative thinkers and other interesting and imporant people. Heck, it's going on now and Bill Gates spoke last week about Malaria -- he released freaking (uninfected) mosquitos into the crowd to show just how serious the problem is. Anyway, bottom line is that exciting stuff happens at TED and this year is no exception. PrePoint caught the Tweets from folks at the show claiming they they got some eyes-on time with the Palm Pre from Roger McNamee (aka our hero). No details, sadly (they asked for no video), but the little guy is making the rounds and getting shown to the beautiful nerdy intelligent people. Now if it would only get released for us little people.